Still, you are here to find some information about HYIP’s and I’m going to provide it. Today I’m reviewing a program, which joined Standard listing on DavidNews.com monitor 7 days ago. MARVEL TRADE LTD is a program offering mid-term plans with daily interest rates from 5% to 6.5% on business days with initial deposit included in them. The program has been already online for 4 weeks. My reinvestment in this program is $200 and it has a “PAYING” status on Davinnews.com monitor since 09.02.18. Let’s take a better look at the program and its main features. MARVEL TRADE LTD is offering 4 investment plans for 12 to 80 business days. Minimum withdrawal is varying from $10 to $3000 depending on the chosen. I assume that the highest potential has the plan called “Prodigy” – 2.8% daily (deposit returned at the end) for 12 business days due to its minimum deposit of $20 and shorter deposit term. No offense but 50, 65 and 85 business days seem a very long-term if compared to 12 business days. Besides, you can add extra 2 days to every 5 days in the term to understand how much time it takes to finish the investment cycle. For example, 12 business days most likely will be 16 days in total depending on the day when you enter the program. Does sound fine to you? Keep reading in case you are still interested. I must admit that MARVEL TRADE LTD legend and the website looks like a fast job due to several reasons. First, there are many typos on the website. Second, the legend begins with the statement “The company's main field of activity is the sales of lots at auction houses throughout the world”, but afterword’s I don’t see any other references to this topic and rest of the content on “About Us” page is generic text, which can be used for any other program. Third, Marvel is a company that owns a number of iconic comic characters and I’m afraid that MARVEL TRADE LTD has copied its logotype. Moreover, the character on the homepage is not one of their “300 experts” but one of the comic characters. I know, it has nothing to do with the performance of the program and programs with quality looking websites turn in to scam as well. I just have this feeling that this program was made in hurry. The website is available for its visitors in English and Russian. I already shared my impression about the English version. Feel free to check the Russian version and tell us if it also has any typos. MARVEL TRADE LTD has active SSL certificate until the may of this year. In terms of functions, it’s very simple – content, news feed, FAQ block and links to the personal cabinet. In case you want to estimate the potential benefit – use your own calculator. Some important information about withdrawals and payments. MARVEL TRADE LTD accepts payments with 4 most common payment options in the HYIP industry – AdvCash, Payeer, PerfecMoney, and Bitcoin. Minimum withdrawal is $1 and there is no withdrawal fee. Accruals are calculated every business day and withdrawals are processed instantly. 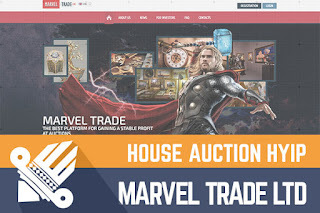 Feel free to contact MARVEL TRADE LTD (e-mail or contact form on the website) in case you would like to find out more about the program or some features that are not mentioned on their website. I already mentioned that most likely highest potential of attracting investors has a plan called “Prodigy” with a net profit of 33% within 12 business days. For example, $200 investment in this plan would generate $5.6 a day and the deposit is returned at the end of the deposit term. Basically, if the program survives 12 business days, the net profit for such investment would be $66, which is not bad for a term of 2-week deposit. Let’s take a quick look also at the plan called “Art” – 5% daily for 50 business days (deposit included in accruals). It takes 20 business days (approx. 4 weeks) to reach the break-even point and another 7 business days to make the profit similar amount we could make the plan called “Prodigy”. This calculation proves the statement that “Prodigy” is more beneficial. The downside of the most common plan is that return of initial deposits will cause withdrawals of larger amounts from time to time. Why does it matter? There is a larger possibility that large sums will be leaving the program if compared to programs where the initial deposit is included in the payments. On one hand, MARVEL TRADE LTD has 3 other plans where the initial deposit is included in accruals, but they are less attractive due to long investment terms. Keep in mind, I’m here to take a better look at programs and share my thoughts. It’s not possible to predict the future of any program on DavidNews.com or other monitors. Therefore, if you ever decide to make any investments, don’t invest more than you can afford to lose! 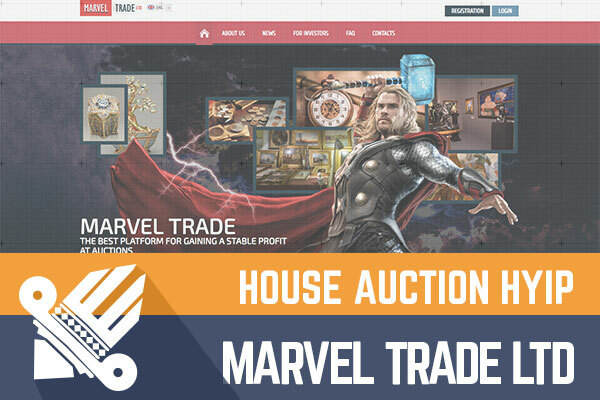 Have you already made an investment in MARVEL TRADE LTD and have any useful information to share with us? Please drop a message in the chat box to share your experience! Investment plans: 2.8% daily for 12 business days, initial deposit returned at the end of the investment term. 5% up to 6.5% daily for 50 up to 80 business days, initial deposit included in the payments. Join Marvel Trade LTD Here!